Songs Of Willow Frost by Jamie Ford “From Jamie Ford, author of the beloved Hotel on the Corner of Bitter and Sweet, comes a much anticipated second novel. Set against the backdrop of Depression-era Seattle, Songs of Willow Frost is a powerful tale of two souls-a boy with dreams for his future and a woman escaping her haunted past–both seeking love, hope, and forgiveness. The Yellow Eyes of Crocodiles by Katherine Pancol has sold some 2.4 million copies, been translated into 30 languages and topped multiple bestseller lists. “The Yellow Eyes of Crocodiles follows Josephine Crotes, a plain, twelfth-century scholar. When her chronically unemployed husband runs off with his mistress to manage a crocodile farm in Kenya, Josephine finds herself trapped. Living off a researches salary in an apartment in a non-descript suburb of Paris, Josephine is at wits end trying to provide a decent life for her two daughters—haughty teenage Hortense and babyish Zoe. Meanwhile, Iris, Josephine’s charismatic sister, seemingly has it all—a wealthy husband, supermodel looks, and a leisurely bourgeois life in her chic Parisian neighborhood–but Iris is dreadfully bored. Mastermind by Maria Konnikova “explores (Sherlock) Homes’ unique methods of ever-present mindfulness, astute observation and logical deduction. in doing so, it shows how each of us, with some self-awareness and a little practice, can employ these same methods to sharpen our perceptions, solve difficult problems and enhance our creative powers. Mastermind follows the legendary detective as he explores the workings of the human mind. It is guided by a central premise: that Sherlock homes serves as a near-ideal window into the psychology of how we think and is a rare teacher of how to think better than we naturally do. While those who read the book may not become master detectives, they will certainly learn more about themselves,t heir minds and their capabilities, and in so doing, will come closer to the Sherlockian ideal of a thinker who knows how to observe–not merely see– the world around him. Maria Konnikova the “Literally Psyched” column for Scientific American and formerly wrote the popular psychology blog “artful Choice” for Big Think. Her writing has appeared in The Atlantic Slate, The Paris Review, The Observers, Scientific American MIND, and Scientific American, among other publications. She graduated from Harvard University and is currently a doctoral candidate in psychology at Columbia University. The Longest Date by Cindy Chupack “takes a hilarious, honest and heartbreaking look at marriage. Deftly balancing the comedic and cringe-worthy aspects of matrimony and establishing Chupack as a leading comic talent, The Longest Date is filled with soulful, personal, wittily self-deprecating stories that follow her new life as a wife, from her first failed marriage (her perfect husband announced one day that he was gay) to her meeting Ian, Perfect Man #2 (for real this time) to their anxious courtship and eventual marriage. It was then that they both discovered that living happily ever after was a matter of constant negotiation…Cindy also chronicles their 5-year journey to parenthood and struggles with infertility along the way–a topic that will leave even the most hardened reader in tears. Published in time for Valentine’s Day, The Longest Date is one of the funniest–and ultimately deeply moving–books about marriage we’ve encountered, and a book that anyone who has ever negotiated a relationship will recognize. 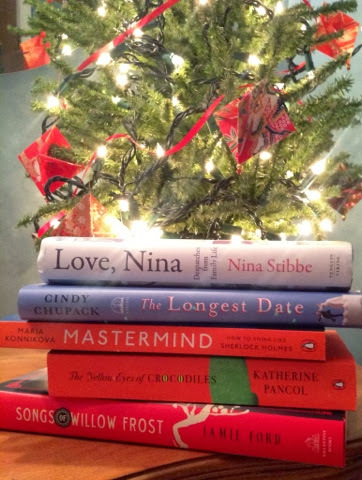 Love, Nina by Nina Stibbe “In the 1980s Nina Stibbe wrote letters home to her sister in Leicester describing her trials and triumphs as a nanny to a London family. There’s a cat nobody likes, a visiting dog called Ted Hughes (Ted for short) and suppertime visits from a local playwright. Not to mention the two boys, their favourite football teams, and rude words, a very broad-minded mother and assorted nice chairs. From the mystery of the unpaid milk bill and the avoidance of nuclear war to mealtime discussions on pie filler, the greats of English literature, swearing in German and sexually transmitted diseases, Love, Nina is a wonderful celebration of bad food, good company and the relative merits of Thomas Hardy and Enid Blyton. Love your books, Bellezza The Yellow Eyes of Crocodiles sounds fantastic. You have a wonderful mailbox! Happy reading!! 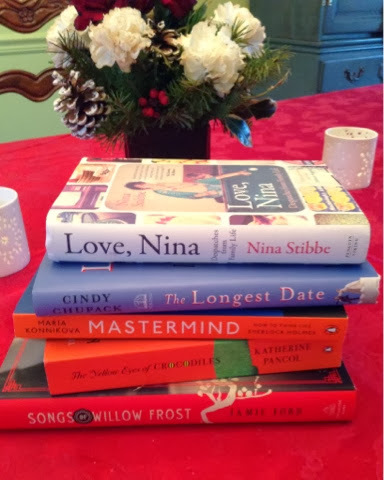 I added Love, Nina to my wish list just the other day. I hope you like it! While it looks like you are getting some of the better ARC's out there, and it is lots of fun to have books in the mailbox, I take a look at my TBR bookcase and am so glad I'm not accepting ARC's anymore. My hat is off to you. I also really love the picture you have in your header. Nice. I've heard great things about Songs of Willow Frost so I think you're in for a treat! I hope you love all of your books. Great mailbox! I have the Yellow Eyes of Crocodiles waiting for me. That one sounds like a fun read. Enjoy your new books! Wonderful mailbox. They all look so good. I especially like the sound of Yellow Eyes of Crocodiles. Songs of Willow Frost is really good, but sad. Mr. Ford wrote another excellent book. ENJOY your week and your books. Thanks for stopping by my blog earlier. International giveaway on my blog on January 2. Hope you can stop by. I began it, and it is good. But, it's “fluffier” than I expected, so I'm putting it aside for another time, interesting premise so perhaps for Paris in July? Thanks, Gautami. I'll be over to visit yours in a minute. I read the first twenty pages and was quite charmed. Now I only wish I knew more about the British culture than the scant knowledge I already have. I think the joy of receiving a special book in my mailbox is what makes me keep accepting ARCs. But believe me, no one is more ready for your TBR Callenge than I! There can definitely be too much of a good thing. Glad you like my header. She's a little more modern than I usually feel inclined toward, yet I loved her casualness. And, of course, the color. I really liked One The Corner of Bitter and Sweet so I suspect I'll like this one as well. Although that reasoning didn't hold true with Lisa See's books which became progressively more depressing to me. Perhaps what appeals to us most is the escape qualities, and especially in Paris. I'm not surprised to hear you say Jamie Alford's book is sad. That's what I expected, or at the very least that it would be tender. Thanks for telling me of your Internationak Give-Away. I'll be sure to stop by! I've heard good things about the Jamie Ford book so I hope you love it (and the rest of your new books). I'm interested that you have heard of it, Melwyk, because it was new to me when it arrived on my doorstep. Perhaps because it is publihsed in the UK? Anyway, we'll have to see how it turns out. So far, it's not very much like The Nanny Diaries which actually made me cry at the heartless cruelty of the mother. Happy New Year, Audrey! And here I haven't even put up a New Year's post…thank you for your good wishes. Thanks, Mary. The House at The Corner of Bitter and Sweet was so tender, I assume this will be as well.